I love how the main ingredient in these dessert Chocolate Almond Flour Waffles is zucchini. Well, and chocolate. Gotta love chocolate. . .
Chocolate and zucchini are two things that I’ve seen in recipes a lot lately. From brownies to quick bread, to milkshakes. Seriously, friends – it’s a huge trend right now (and has been for the last couple of months). So I thought about using the ingredient combo in something different and that’s how this recipe was born. And truth to be told – they are amazing! If you are not a fan of stuffing veggies into sweets, then you should totally make this recipe because you are not even going to realize there is zucchini in there. For me, it’s almost like magic. You shred a ton of zucchini, mix it with a couple more of things and this fluffy, chocolaty waffle comes out of your waffle maker. Can we just agree this is pretty amazing? I also find that not only the texture but the flavor is also really good, and I’m not saying this in a “This tastes good for something healthy” kind of way, I’m saying it in the “Oh my gosh! I never had something so delicious in my entire life!” kind of way. So really, head to the kitchen and make this ASAP. And to make things even better – you can also freeze them for later. So I’ve been making a big batch of these Chocolate Almond Flour Waffles and then storing them in the freezer to have ready to eat for breakfasts during the week. You just need to reheat them for a couple of minutes (using the microwave, the toaster or even placing them in the oven) to have waffles that taste like they just came out of your waffle maker. They are so convenient that I actually found me sneaking them a couple of times for dinner. The zucchini is practically undetectable in the finished waffles. You may see a few flecks of dark green zucchini skin on the waffles’ surface, but it would take a very perceptive picky eater to notice. If I receive a load of zucchini from people’s gardens, I shred it and freeze it in plastic bags so I can bake with it whenever I want. I don’t like to thaw and re-freeze it over and over because the flesh breaks down too much, and it gets soupy. I finally figured out that a convenient way to avoid this is to bag it in two-cup increments. I notice many recipes call for two cups of zucchini, so it’s handy to be able to just grab a bag to thaw. If a recipe calls for more or less I use what I need to, but I always measure any leftover zucchini and mark how much it is before I put it back in the freezer. I find these are a great way to add a little “give” to Paleo baking in the absence of gluten. They can also replace some of the eggs in certain Paleo recipes. I’ve seen recipes call for as many as 10 eggs, which can get expensive, especially if you’re baking for more than one or two people. Both are very nutritious, so I feel good about using them. In this recipe, I used them both to add a wider variety of nutrients. I believe they act about the same in baking, so it would be fine to just use one or the other in this recipe. Cocoa vs. Cacao – Which to Choose? 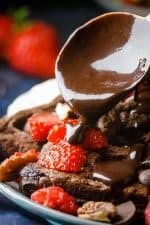 I was looking at https://blog.paleohacks.com/cacao-vs-cocoa/# for some information on whether it would be better to use cacao powder in recipes, or if the plain cocoa powder I usually use is good enough. My understanding is the difference between the two is cocoa powder undergoes extra processing to make it slightly sweeter. It’s not a shocker that this extra processing takes a toll on the antioxidants and other exceptional nutrients contained in raw cacao beans. Cacao is the better choice nutritionally, but cocoa still offers decent health benefits even after all that processing. It looks like the product to avoid is sadly one of my old favorites, Dutch-processed cocoa. It’s processed and treated further than regular cocoa, so it’s quite dark and has a more mellow dark chocolate flavor. At that point, the cacao has a fraction of the original health benefits left. Cacao may have a sharper taste than cocoa, but that’s the main difference I’ve noticed. I intend to experiment with it more as I Paleo-fy recipes. It looks like Amazon offers quite a few cacao powders to bake with, and I’ve even seen it at my local grocery store so it’s easy to get hold of. It’s easy for me to forget that I don’t want to grab just any old bag of chocolate chips at the grocery store. The vast majority of what’s in the baking aisle is full of stuff that’s the opposite of Paleo, but old habits die hard. I’m thrilled that my store at least started carrying Enjoy Life brand chocolate chips to grab in a pinch. They’re delicious, but I love trying the various brands of Paleo chocolate chips Amazon sells too. Regular chocolate chips were a different story, but I’ve never had a Paleo chocolate chip I didn’t like. Why Beat the Egg Whites Separately? 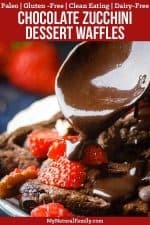 When I set out to convert my old chocolate waffle recipe to Paleo, and add zucchini just for fun, I had to do some research. So I looked at a lot of similar recipes. Consistently, people who made this kind of waffle said they were very soft. Crispy outsides are a big part of what I like in a waffle, so I get their point. Beating the egg whites separately and folding them in at the end seems to do the trick. It was a happy accident because the beaten whites were only meant to make the waffles fluffier. The crisp outsides were a bonus. The reason I share a method where you can add the eggs whole is that I think the softer waffles are pretty good, and I imagine other people might feel the same. The crisper outside might not be worth the extra steps to everyone, or if you’re pressed for time. It can be hard to tell which steps in a recipe are vital to it turning out, and which make the food nicer but are less essential. The beaten egg whites are the latter, and I thought some people would appreciate the option. A regular thumb-triggered ice cream scoop is an easy, less messy way to load the batter onto the iron. Three scoops of batter placed near the center of the iron make waffles come out about the same size and shape almost every time. I love how the main ingredient on these dessert Paleo waffles are zucchini. Well, and chocolate. Gotta love chocolate. . .
Grate the zucchini and place in a large bowl. Don’t bother peeling it first or squeezing out excess water when you’re done. Stir the chia and flax seeds into the zucchini. Cover loosely and set aside. Put everything from the dry ingredient list in a bowl and mix together very well. Stir with a whisk instead of a spoon, and use a sifter for best results. Stir the vinegar, oil, vanilla and honey or syrup into the zucchini mixture. For waffles with crispy outsides, separate the eggs. Add the yolks to the zucchini mixture and set the whites aside in the refrigerator. For shortcut waffles with soft outsides, add the eggs to the zucchini mixture without separating. Add the dry ingredients to the zucchini mixture gradually. For best results, use a sifter. The batter should be thick but pourable from a ladle. If it’s too thick, add milk a little at a time to thin it. If you separated the eggs, beat the whites with the cream of tartar until stiff peaks form. Gently fold the beaten whites into the batter. For both versions, preheat the waffle iron on the highest heat setting. Consult your model’s instructions for using the iron safely. Fold in the chocolate chips and set batter aside until the iron’s ready. Grease the iron if it’s not nonstick. Standard-size irons will use about 3/4 cup batter for each waffle. Spread the batter to about 1/2″ from the iron’s edge before closing lid. Cook for two and a half to three minutes, or until the waffle stops steaming. Serve fresh from the iron, or keep warm in a low oven (200 F-250 F). Rest waffles on wire racks placed on cookie sheets to keep them crisp. Really, any cooking oil will work. My husband is allergic to coconut oil too, so we use a lot of avocado oil. Just whatever oil works for you.